IBM BigFix Compliance PCI Add-on provides more than 3,000 checks over 20+ platforms or applications, with each check mapped to a specific PCI DSS requirement to monitor the security configuration of an endpoint. It significantly reduces the cost and effort associated with mapping and implementation of the PCI requirements to each platform that needs to comply with PCI. A local, low-resource impact agent continuously monitors each endpoint's configurations—whether it is connected to the network or not—to identify and report on any noncompliance. Compliance drift is discovered immediately and can be fixed effectively with remediation actions to reduce risk and labor costs. 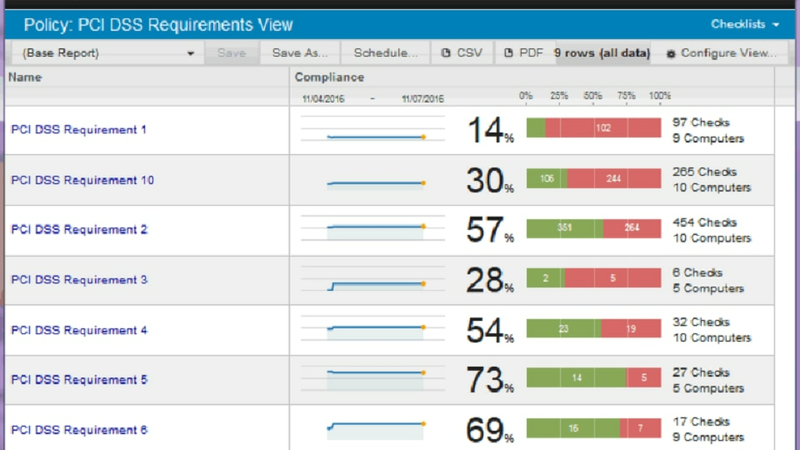 PCI compliance specific dashboards provide clear visibility to the overall compliance status across the entire enterprise, report progress and trends toward the compliance goal, and identify incompliance areas or endpoints quickly. PCI requirement specific reports help reduce auditing effort and complexity, and PCI milestone specific reports help prioritize compliance focus areas. Based on the same BigFix Compliance monitoring and reporting infrastructure, the PCI Add-on allows you to fully utilize the existing BigFix investment, leveraging the same endpoint management resources and processes, and easy extension to PCI compliance with little additional effort.